July 5, 2016, 1:22 PM · Did you know that a pianist can play our beloved Bach Chaconne for solo violin from the D minor Partita -- with one hand? I didn't know, until my dear friend Lana Marina did so -- at the Cliburn International Amateur Piano Competition last week in Fort Worth, Texas. In fact, I didn't know that a lot was possible until I saw the video of her onstage playing at the Cliburn, and considered what it took for her to reach that moment. 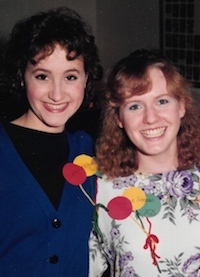 I met Lana in college, when we were both music majors at Northwestern University (see picture right- ooh my '80s hair!). I was a little bit of a piano wannabe, so I used to sneak into the weekly piano recital hour with her and her fellow piano students to listen to them play. I still remember her lightning speed in Beethoven's Waldstein Sonata, among other things. After music school, Lana went to Law School at Cornell University, then found success as a trademark lawyer. As good as she was at music, she stopped playing the piano. When Lana returned her attention to the piano in 2012, she had not played in 22 years. Playing those first notes after that kind of hiatus had to take guts. The Cliburn requires some 50 minutes of recital music plus a movement from a concerto, and mastering that took her four years of discipline, new lessons and self-driven hard work. Entering the competition itself took sheer daring. And there is more to it than that. Since 2007 Lana also has lived with multiple sclerosis. Setting the goal of playing the Cliburn was an act of life-affirming defiance, not to be limited by MS. The night before the first performance, she suffered a relapse in which her legs stopped working, and her doctors recommended against leaving the hospital. She left, and she performed anyway, with her husband and daughter helping her on and off stage. She got through three rounds and was one of 12 semi-finalists. Though she did not make the finals, she won a Jury Discretionary Award. She had prepared one heck of a lot of repertoire for this: "Variations on Themes from Bizet's Carmen" by Horowitz; Liszt's version of Paganini's "La Campanella"; Beethoven Sonata No. 3 I; Balakirev's Oriental Fantasy; Brahm's Etude No. 5 for left hand, after J.S. Bach’s Chaconne in D Minor, BWV 1016 and an arrangement by Schultz/Evler of music from "By the Beautiful Danube." Had she played the final round, she had prepared the third movement "Presto" from Mendelssohn's Piano Concerto No. 1 in G Minor. I'm no expert on piano repertoire, but as far as I can tell, Lana packed her program with virtuoso pieces. Still, I kept coming back to the Bach Chaconne, arranged by Brahms for left hand only. You can find her performance in the video below, at 6:07:30. I love this piece on the violin, but as you can hear, it sounds beautiful on the piano. Brahms knew what he was doing, too; he had great respect for the piece. As Brahms famously said upon discovering it: "On one stave, for a small instrument, (Bach) writes a whole world of the deepest thoughts and most powerful feelings. If I imagined that I could have created, even conceived the piece, I am quite certain that the excess of excitement and earth-shattering experience would have driven me out of my mind." Brahms' transcription for piano left hand is faithful not only to Bach's original notes, but also to the way they must be realized on a violin. For example, Brahms expressly writes into the score the many compromises we violinists have to make when playing a succession of three- and four-note chords on four separate strings, with a bow. The piece has a certain divine essence, it can absorb and haunt the listener. I truly love it. Some 10 years ago, I studied it enough to get it into my fingers and let it creep into my soul -- though I never felt like I'd mastered it well enough to think of performing it. I like to play the Sonatas and Partitas in rotation, but in recent years I've avoided the D minor. It's just too monumental. Plus, it's kind of long. And it doesn't exactly play itself, it has all kinds of finger-twisty chords, awkward string crossings, complex voicing. Technically speaking, if you want to be literal about it, it's physically impossible to play what Bach wrote on the page, on the violin. It would help to have three hands with six fingers on each. However, after hearing Lana perform it (single-handedly!) and perform all the other things she played with both hands on the piano, I'm seeing my line of thinking for what it is: ridiculous. "If you can dream it, do it." That quote often is attributed to Walt Disney, though my Theme Park Insider husband tells me it's actually a line written years after his death by Disney Imagineer Tom Fitzgerald for the old Horizons ride in Disney World's Epcot theme park. But it's age-old human truth. We look for excuses to avoid those difficult yet noble things that we feel called to do. Yet those monumental, impossible, improbable things we want to do because we were made to want to do them -- those are the very things we should pursue with single-minded doggedness. Lana's accomplishment certainly is a testament to that. July 6, 2016 at 08:12 AM · My favorite transcription of this piece is for guitar. Take a listen. July 6, 2016 at 07:27 PM · Thanks a lot for sharing the story, Laurie. I really admire her. I didn't know about this amateur competition before you started to share about it. July 7, 2016 at 05:11 PM · One of my colleagues performed in the first amateur Van Cliburn in 1999. There were some 90 pianists in the first round, but still just getting there was quite an accomplishment. Her age (about 60 at the time) caused quite a stir. The Fort Worth Star-Telegram reported, "The audience favorite of the afternoon was a research chemist and grandmother from Virginia, who devoted her program to a richly textured reading of Chopin's Ballade No. 1." She still practices and performs. You do the math. She and Lana Marina are inspiration to us all.